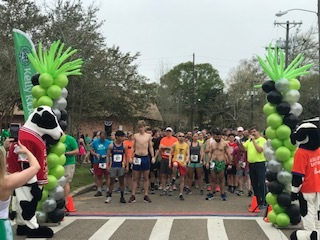 Kelly Kicking Cancer hosted its 4th annual Shamrock Sprint at the Covington trail head on Saturday March 9. Over 200 runners participated to help make our 5K a big success. You helped us raise over $15,000 to fight brain cancer through advanced research. Beneath slightly overcast skies, the morning of fun, food and camaraderie was kicked off by Elizabeth Burris singing a beautiful rendition of "The Star Spangled Banner". Covington Mayor Mike Cooper kicked off the 1 mile Fun Run. 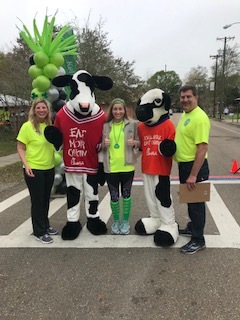 Eleven year old Dan Barnard of Covington placed first with a time of 6:07, followed by Corrine Durio of Mandeville (7:13) and Amber Buquet of Covington (7:19). 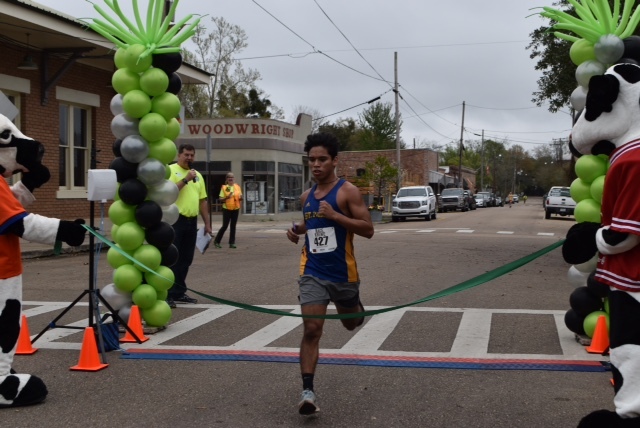 The 5K was won by Frankie Durio of St. Paul's School with a time of 16:33, followed by Ed Washburn of Mandeville (16:51) and Don Garvey of Mandeville (19:46). This was Frankie's third straight victory in the Shamrock Sprint! Congratulations to all the participants who ran, strolled or walked their way through the course. Dan Barnard, 1 mile Fun Run winner. 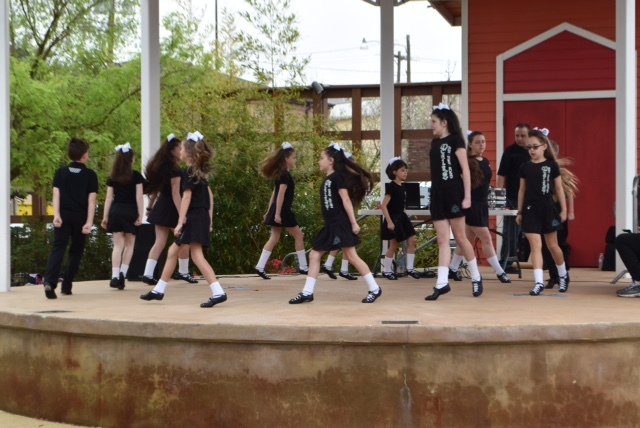 While the results were being tabulated, we were entertained by the McElroy Irish Step Dancers. These talented young dancers put on a great show for us. We had a special appearance from the the Chick Fil A Cow and Mini-Moo The Calf. These crowd pleasers circulated through the crowd all morning, encouraging the runners, handing out gifts and bringing general cheer to everyone. Whoever you are, you are always welcome. We were blessed with the presence of a courageous young woman, Megan Deen, a recent graduate of Mississippi College who knew of Kelly. Megan contacted us last fall after she was diagnosed with brain cancer. We shared our experiences of the disease with her and what she might expect. Since then Megan has had surgery to remove the tumor and is continuing to recover from this devastating disease. She is a strong woman, and we pray for her continued recovery. Thank you Megan! 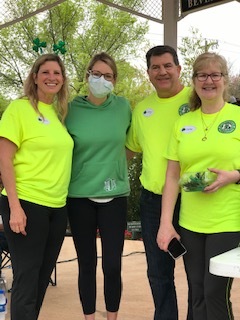 The success of the 2019 Shamrock Sprint was the result of the hard work of hundreds of volunteers who share our commitment to eradicating brain cancer. A special thanks to our 5K Chair Cathy Lackner for her tireless dedication. Thank you to all the vendors for participating, and to Gallagher's, Jim Marque/Halliburton, Jimmy Johns, Dunkin' Donuts, McAlister's, Chick Fil A, and Jersey Mike's for the abundance of food, and Crescent Crown Distributing and Artesia Apartment Homes for the beer and water. No one ever leaves the Shamrock Sprint hungry or thirsty! Thank you to the dozens of course marshals who work to keep things safes for the runners, and thank you to those who participated in the run. You have made the 2019 Shamrock Sprint a great success. To view all the race results, click the "LEARN MORE" link below.